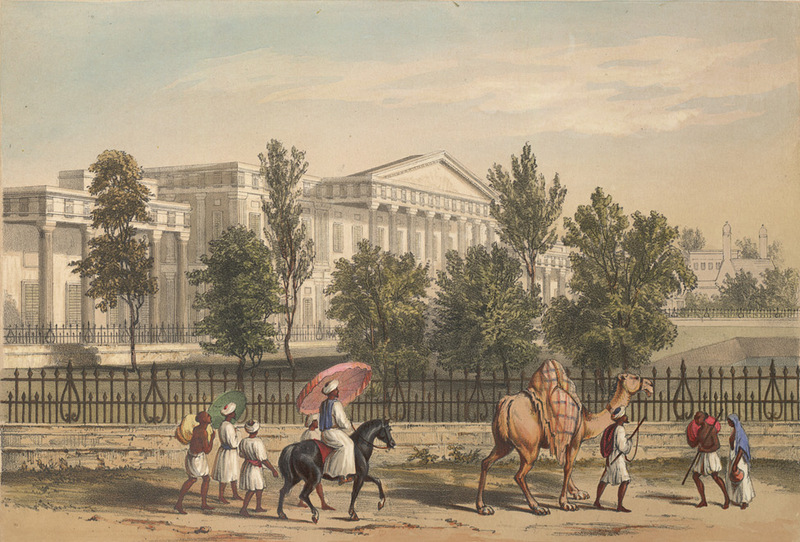 This painting depicts the Islamic College of Calcutta. popularly known as Madrasah-e-Aliah or Calcutta Madrasah, the first educational institution set up in India in 1780 by Warren Hastings, to train Muslim men for office in the courts of justice. It taught Arabic, Persian and Islamic Law. The original building was completed in 1782 and was situated on the south side of the Bow Bazaar, but the college moved to Wellesley Square in the 1820s. Many eminent scholars were associated with this institution as administrators, principals, teachers as well as students. Calcutta Madrasah was upgraded to Calcutta Madrasah College and then to Aliah University in recent time. This entry was posted in Educational Institution, English Education, Vernacular Education and tagged Bow Bazar, Calcutta Madrasah, charles d'oyly, colleges, Madrasah, Mohammedan College, Warren Hastings, Wellesley Square.